Ovenden beat National Conference League opposition for the second round running to get to the semi-final of the BARLA National Cup on Saturday. East Leeds had no answer to the big Ovenden pack, led by man of the match Macauley Higgins, and were beaten 48-22 at Four Fields. The pace of the Ovenden three quarter line troubled the visitors, in particular full back Graham Charlesworth, while half backs Sean Dyson and Chris Holroyd pulled the strings in a great team performance. 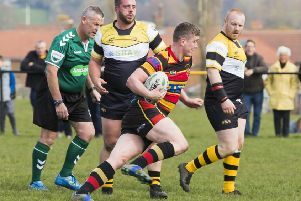 Charlesworth and Higgins each scored two tries while Jason Dodd, Joss Bentley, Dyson and the returning Niall Brady also went over the whitewash. Holroyd tagged on three conversions and Brady was successful with five kicks from five. Ovenden now welcome Illingworth to Four Fields in the Halifax Cup on Saturday (2.30).